A 6.2 percentage point increase in the unemployment rate, and one of unprecedented suddenness. A 7.8 percent fall in real GDP. A 3.5 percentage point increase in BBB spreads. A 26 percent decline in house prices. A 35 percent drop in commercial real estate prices. A 50 percent fall in the stock market index. The Federal Reserve’s “Policy Statement on the Scenario Design Framework for Stress Testing” released in 2013 states that the severely adverse scenario would “reflect conditions that characterize post-war U.S. recessions,” but the 2019 severely adverse scenario is substantially more severe than the recession experienced in the 2007-2009 financial crisis, the worst of the post-war recessions. As shown in the chart below, the 2019 severely adverse scenario assumes a larger and much more rapid increase in the unemployment rate relative to what was experienced during the past financial crisis. In particular, the 2019 scenario assumes that the unemployment rate would rise 4.6 p.p. during the first year, while it increased only 2.1 p.p. in the first year of the 2007-2009 financial crisis. The decline in real GDP is twice what was experienced in the Great Recession. Moreover, just looking at the trajectories of the macroeconomic variables over the 9-quarter stress horizon provides an incomplete picture of the impact of the scenario on bank performance under stress. 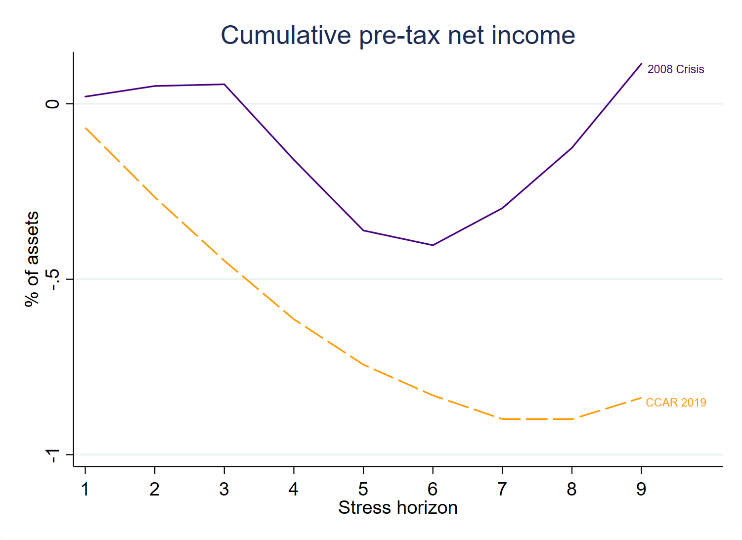 In practice, the overall decline in GDP, for example, does not have the same impact on banks’ pre-tax net income under stress as the rise in the unemployment rate; thus, the severity of each variable included in the scenario is not equally important in assessing banks’ performance under stress. In the remainder of the blog post, we assess the severity of the stress test scenario by looking at banks’ projections of loan loss provisions and pre-tax net income using top-down models that relate a subset of the variables included in the supervisory scenarios to industry-level bank-performance measures (see here for details on the models used). 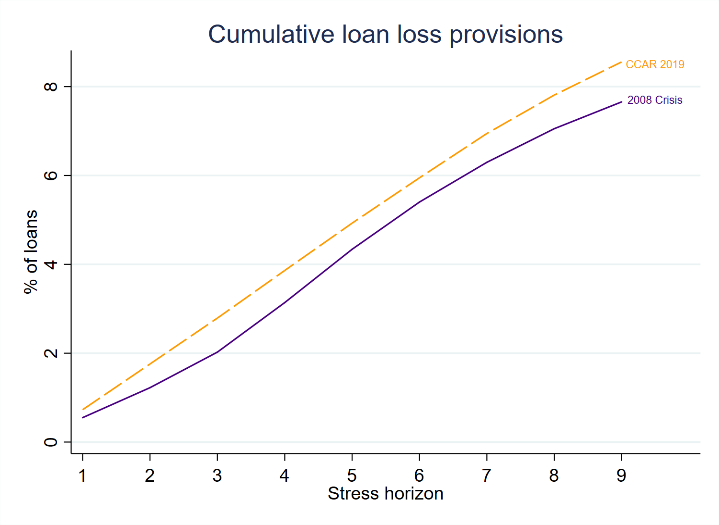 The chart above depicts the projected path of accumulated loan losses over the 9-quarter stress horizon under the CCAR 2019 severely adverse scenario. As a reference, the projected values calculated using the economic conditions during the financial crisis is also reported. 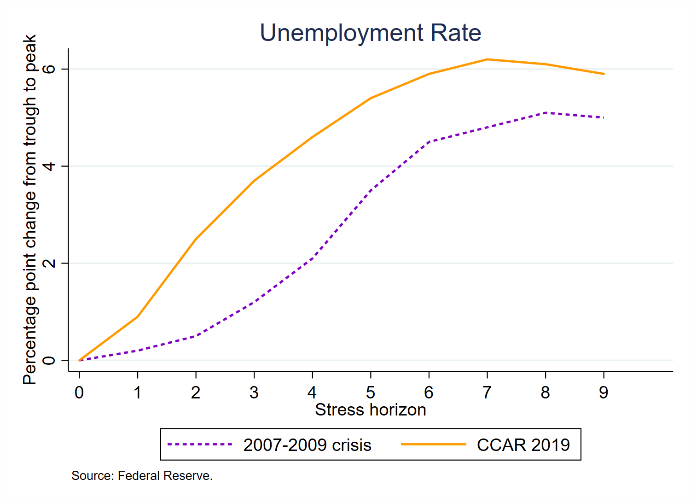 Through the lens of the projections for loan loss provisions, the chart shows that the CCAR 2019 severely adverse scenario is much more stressful than the past financial crisis. For instance, our model projects loan loss provisions to peak at 8.6 percent of loans in CCAR 2019 at the end of nine-quarter stress horizon, while they are projected to peak at 7.7 percent using the economic conditions that prevailed during the financial crisis. 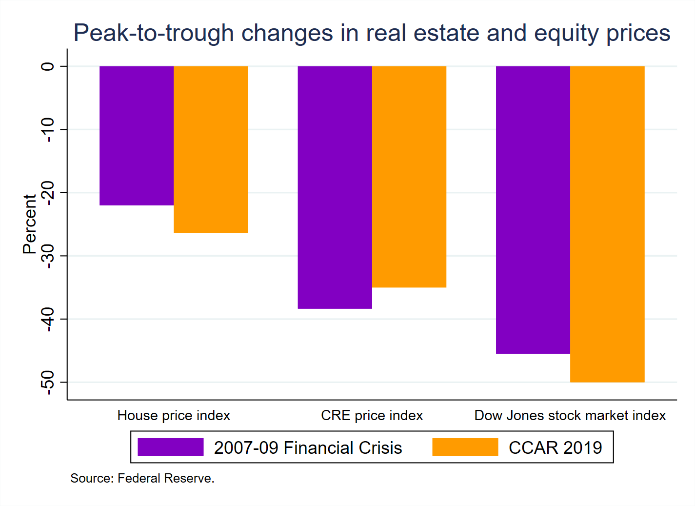 The 0.9 percentage point difference in projected loan loss provisions between CCAR 2019 and the financial crisis is quite material and has important implications for peak-to-trough declines in regulatory capital ratios under stress. The picture is even more stark for pre-tax net income, a comprehensive measure of bank performance. The forecast for net income is calculated by summing a projection of pre-provision net revenue and a projection of loan loss provisions over the 9-quarter stress horizon. 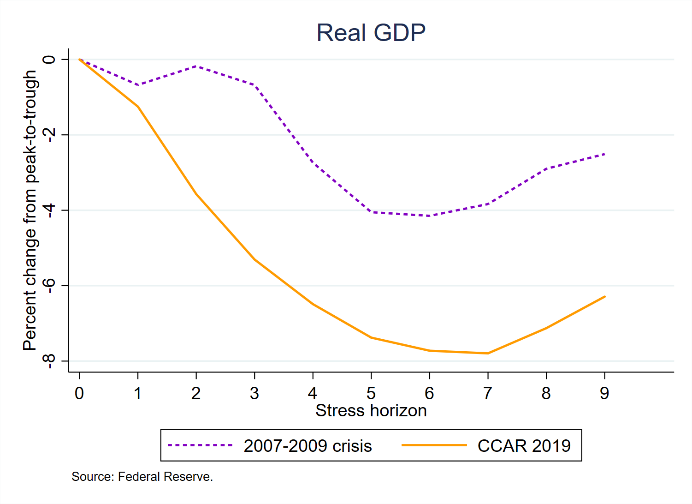 By this metric, as shown in the chart above, the 2019 stress scenario is approximately twice as severe as the economic conditions that prevailed during the 2007-2009 financial crisis. 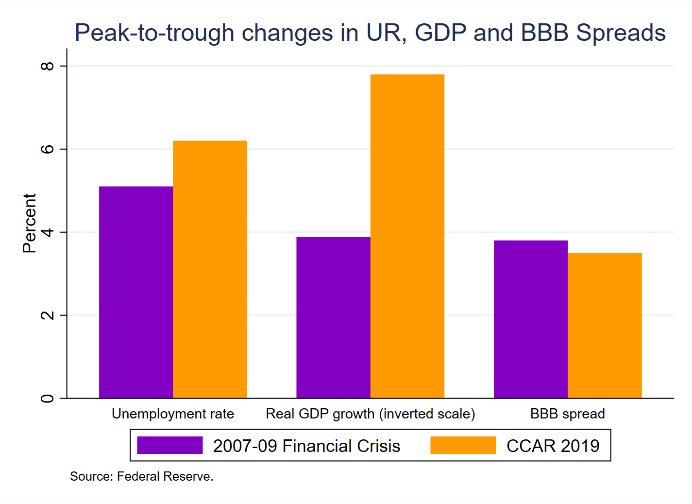 As indicated by the significantly more severe trajectories of the unemployment rate and real GDP in CCAR 2019 and by forecasting the impact of the path of macroeconomic variables on key measures of bank performance under stress, we have shown that the Federal Reserve’s 2019 scenario is much more severe than the 2007-2009 financial crisis and any post-war recession. It is therefore inconsistent with its own guidance for how it constructs the stress tests. And, once again, it was issued without prior notice and the opportunity for public comment, including analyses like this one. Despite the heightened severity of the stress tests, we expect U.S. banks to meet the post-stress hurdle rates because of significant increases in capital over the past decade.